Need some inspiration for the Postcards from Parenthood Blog Carnival? This might help. You're welcome. Click here to find out all about the carnival and how you can participate (and win an awesome gift certificate from My ChiChi Baby). Please take a moment and click on the juggling mom below. 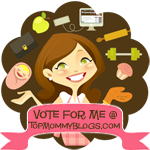 Doing so equals a vote for me on Top Mommy Blogs.